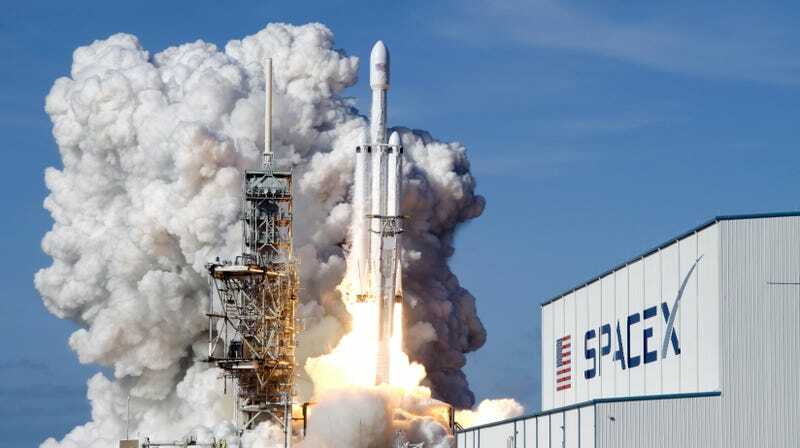 Update on Thursday, April 11 at 8:00 pm : A little more than a year after its test flight and one day after a scrubbed launch, SpaceX on Thursday successfully launched its Falcon Heavy rocket. The company also saw the successful triple landing of all three of its three boosters. SpaceX is set to launch its Falcon Heavy later today, in what will be the first commercial flight for the world's most powerful rocket. As part of the mission, the Elon Musk-led company will attempt to make history by landing all three boosters. You can watch it all live right here. As noted in a SpaceX mission overview, today's launch from the Kennedy Space Center in Florida is scheduled for 6:36 pm ET (3:36 pm PT), but with a generous launch window that will bleed over into tomorrow. Should the launch be scrubbed, SpaceX will try again tomorrow at the same time. The rocket was supposed to go up yesterday, but the launch was canceled due to high winds. Today's launch go as planned, all the mark the second flight for the SpaceX Falcon Heavy. The inaugural launch of the gigantic rocket happened on February 6, 2018, in which Musk's red Tesla roadster was flying into the depths of space. As of late 2018, the vehicle and its lone occupant, Starman, are somewhere beyond the vicinity of Mars. This will be the first commercial mission for the Falcon Heavy. It's delivering the 6-ton Arabsat-6A satellite to geostationary orbit some 36,000 kilometers (22,500 miles) above the Earth, the AFP reports. The Saudi telecommunications satellite will deliver "television, radio, Internet, and mobile communications to customers in the Middle East, Africa, and Europe," according to SpaceX.
. All three boosters are expected to return to Earth in what will-fingers crossed — be the first triple landing or reusable rockets. The two side boosters will attempt their landings at SpaceX's Landing Zones 1 and 2 at Cape Canaveral in Florida, while the center core will attempt to land on a droneship named Of Course I Still Love You which is currently stationed in the Atlantic Ocean.